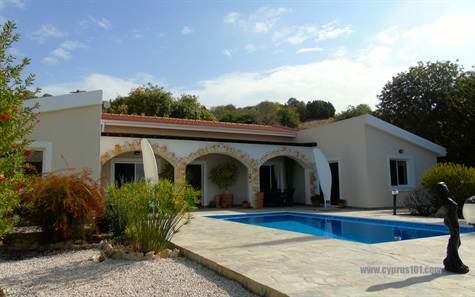 Armou, Paphos – This impressive custom built property for sale in Armou is situated in a peaceful rural setting on a large private plot near the traditional village of Armou. Paphos Town and the main highway to Limassol is a few minute’s drive away and easily accessible. Designed and built to a high specification for the current vendors, the property is in immaculate condition and great attention to detail has been given to the layout and finishes. The accommodation features a large central living room including corner feature fireplace with wood burner fire. Patio windows to the side provide easy access to a covered veranda with stone frame arches overlooking the paved pool terrace and wonderful sea views beyond. Attractive arches separate the living room from the spacious dining room and well equipped modern kitchen with central island. Appliances include double oven, gas hob, stainless steel cooker hood, fridge/freezer, washing machine and dryer. From the living room an archway leads to the stunning master suite. The master bedroom has plenty of fitted wardrobes including one section with mirrored doors and there is direct access to the pool terrace via patio windows. The stylish en-suite bathroom is modern and includes a fitted vanity unit and heated towel rail. In the hallway outside is a large linen cupboard with fitted radiator for airing clothes and bedding. From the dining room a hallway leads to two further double bedrooms with fitted wardrobes, one of which has patio windows opening on to the pool terrace and gardens. A spacious modern shower room is accessed directly from the hallway. Moving outside, the plot is designed with low maintenance in mind. The gardens are beautifully landscaped with a variety of shrubs and trees and to the rear is a large terrace directly accessed via the kitchen. At the entrance is a double driveway and car port. This beautiful home is exceptionally maintained and lovingly cared for – a perfect option for permanent living or a holiday retreat. There are full title deeds.